A number of refinements were carried out on the SFC after feedback from the PCRA Club round and a one-day test at Eastern Creek shortly after. We felt like things were going pretty well, and headed off toward Sydney with car and trailer heavily loaded with all the paraphernalia one requires for a race weekend. The two things to triple check before departure - the bike and the log book. In Australian racing you need a log book issued by the licensing authority, sort of like your registration papers for the road. Without it you will not race. We arrived on Thursday afternoon to find the irrepressible Ian Morrison already setting up the OzLaverda pit, where we'd be operating from. Friday would be a practice day, not officially part of the race meeting but many competitors were taking advantage of the time for setup and familiarisation. We got the pit set up and retired for the evening. The practice day on Friday was spent mainly just running laps and making small setup adjustments, the bike was running well and Drmsby was still working out the subtleties of the track, experimenting with different lines and fine tuning gearing. One aspect of the bike had been problematic throughout – the gearbox. More accustomed to modern machinery, he was having occasional but persistent false-neutrals both on the up and down shifts. Turn 1 at Eastern Creek is one of the fastest in Australia and it required him to roll off and shift to fourth so as to be able to power out of the corner with good revs. On one lap he got a false-neutral into Turn 1 and rather than attempt the corner he stood it up and went straight on into what was once the drag strip start line. However what looked like grippy tarmac covered in rubber turned out to be slippery as hell and he had a major problem pulling up before the concrete wall. Glad I didn't see that one! Aside from the gearbox problem, the times indicated we could certainly give the post-classic class a decent crack and we were looking forward to the weekend. Saturday dawned and we headed into the circuit with nervous anticipation – the meeting proper was under way. Our Post Classic Unlimited class was once again sharing the track with the Period 5 Forgotten Era Unlimited bikes, a strong field of 40-odd. We were due out early for the second event of the day – straight into qualifying. The practice of the previous day worked well for us and Drmsby dropped straight into a good pace as usual, posting a best time of 1:48.91, putting us 7th outright and the leading Post-Classic bike! 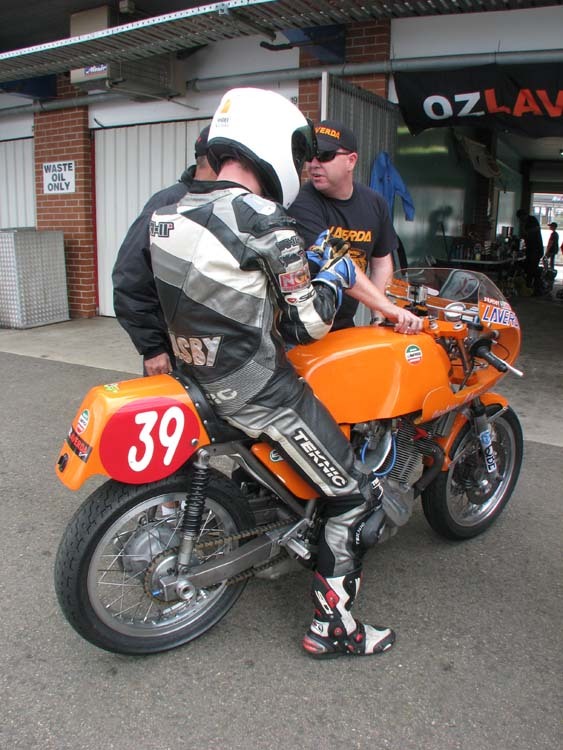 Of our main competitors in the class, reigning Australian Champion Robert Young was in 10th outright on his Father Ron's wickedly fast Ducati – the proclaimed “world's fastest bevel” and who could disagree? Behind him was Stephen Wood in 12th on a T-Rex Honda 4, and Sam Muldoon in 13th riding a highly modified Yamaha XS650. Our first race came at nearly midday. 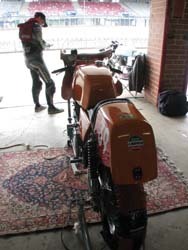 Drmsby finished well to come home 10th on track, second in class just a few seconds down on Robert Young, and having run a personal best lap time of 1:46.41, only 0.15 down on the Post-Classic fastest lap set by Robert. News came through that Robert had jumped the start and was penalised 10 seconds, promoting us to 9th outright and winner of the Post-Classic class! We came to the meeting with the likeable Robert Young as the benchmark by which we would measure ourselves and although we had not yet beaten him on track, to run within 5 seconds of him over race distance was already a great achievement. Post Classic Race 2 came at the mid afternoon mark and represented steady progress. Some setup tweaks and Drmsby's gaining experience on the bike brought him home in 8th place outright, this time 8 seconds down on Robert Young, winner of the Post-Classic class. More encouraging though was the fact Drmsby's fastest lap had improved to a 1:46.01 – 0.08 faster than Robert, for Post-Classic fastest lap! This represented our last race for the day, and in spite of the fact we now had great confidence in the “Merc duplex” primary drive chain system now employed, we took the opportunity to replace it with a new one for Sunday just to be sure. Pleasingly, other than setup adjustments this scheduled maintenance item was the only time we had to touch the bike all weekend. After a pleasant dinner with the other Laverda people on Saturday evening, we showed up bright eyed and bushy tailed for Sunday. The day's schedule called for Post-Classic Races 3 and 4, plus the two Barry Sheene Feature races, open to the fastest 40 pre-1982 bikes of the meeting where our times had put us in a better than expected 9th place on the grid. Perhaps the most remarkable performance was that of Kiwi Steven Bridge riding a Norton 750 (for some reason entered as a Forgotten Era bike) which was running up front with all but the quickest Forgotten Era Unlimited machines. Our first event of the day was the Barry Sheene Feature Race 1. Drmsby was running strongly in the top-10 when the race was red-flagged due to a fall by Malcolm Campbell on the XR69 Suzuki. If anyone thought that ex-international riders who compete in these sort of events are just there to sign books and tour around, a nasty fall on the very fast turn 8 by the 52 year-old Tasmanian ex-HRC rider while pushing for the lead will tell a different story. Unfortunately Campbell was injured and would take no further part in the meeting. At that time we thought the race was finished and it was only at the last minute that we realised a re-start was underway. A frantic dash around the pits got Drmsby out of pit lane just in time and he had a brilliant second half of the race, catching and passing Robert Young to finish 6th outright, the first Post-Classic bike and setting what would stand as the fastest Post-Classic time of the meeting with a 1:45.01. Unfortunately Robert Young crashed on the first lap of the Paul Dobbs F750 race – in which we were not competing – and was out for the rest of the meeting with an injured ankle. It was a great disappointment that we could not continue our stoush for the rest of the meeting, but such is racing. With Robert out of the picture our closest competitor became Stephen Wood on his T-Rex CB Honda. Thus far we had run comfortably faster than him, but he was only slightly down on us, so we knew we had to keep the pace up without suffering any mishaps if we wanted to take the Post-Classic win. Drmsby only really has one speed- flat out, but in Post-Classic Race 3 he backed off the pace just enough to run at a safe pace while not losing concentration. Steady 1:47's still saw him finish 5th thanks to Campbell and Nowland who had gone by the wayside, and most importantly we kept Stephen Wood behind to once again take the class win. We had just two races to complete, and by mid afternoon we were out again for the Barry Sheene Feature Race 2. Drmsby was storming along in 8th place outright at the end of lap 1 when he got a false neutral going into the super-fast Turn 1. A real heart-in-the-mouth moment for everyone, but Drmsby collected the situation beautifully, braking hard and threading the needle across the grass at over 160kph onto a small access track in the run-off area. He dropped a few places but rejoined and pushed hard. There was another exciting moment around the fast Turn 8 late in the race, a big slide on the fast left-hander which made the crew hold their breath but was shrugged off by the rider later as “no big deal”. Check out the video to see the fun. After the drama subsided he picked back a few positions and ran a fine 1:46.69 on the last lap to finish 8th outright. On combined points we had finished the Feature race series in 8th place, leading post-classic bike and on equal points with 6th. This left just the 4th and final Post-Classic race. We had to maintain focus as although we could finish behind Stephen Wood and still take the overall Post-Classic win, a DNF would see Wood the victor. Starting the bike for the final race, there was a strange rattle at idle, but with no time to investigate we just crossed our fingers and sent him out. A combination of tyres past their best and it being the last race of the meeting seemed to mean everyone was down on previous pace. Drmsby maintained focus and rode as required to come home in 5th place outright and confirm the Post-Classic win! The reliability and speed were a testament not only to Drmsby's brilliance behind the bars and Steve's careful bike development and preparation, but also to the dedication of the rest of the SFC crew and supporters; Craig Macleod, Kian Macleod, Chris Cutler, Christiane Weissbach and Ian Morrison.